Rave reviews for our first release! "....Great label, superb compilation. Highly recommended." If there's one thing I've learned from doing Splendid, it's that there's an incredible amount of amazing music being made in Canada. Harangue I is the newest, and one of the best examples I've heard. 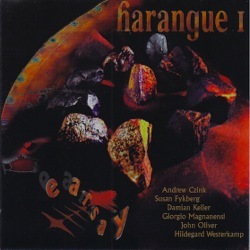 It features six contemporary compositions that could loosely fit into the catchall electroacoustic genre; each piece blends some degree of classical composition (style, if not instrumentation) with the many "sonic painting" techniques afforded by modern recording technology. The disc begins with Andrew Czink's "shadeless, peopled", which captures the absolute stillness of heat haze using gated metallic noises and the lingering, subaudible hums into which they subside. Susan Frykberg's "Astonishing Sense of Being Taken Over by Something Far Greater Than Me" makes an effective contrast, pairing comparatively traditional violin work with a variety of external sounds and digitized voices to depict the birth process. In "To Lions Gate", Damian Keller uses modified and mutated ambient sound, along with some man-made sounds, to create what is essentially a sensory/emotional audio picture of the titular bridge's soundscape -- sometimes quiet, sometimes bustling, sometimes menacing. In "Sere," Giorgio Magnanensi manipulates various sound reproduction technologies, recombining them as a jittery, melodic new work that's simultaneously human and mechanical. Hildegard Westerkamp's "Talking Rain" uses snippets of recorded rainfall, using them to build melodies, percussion patterns and intricate textures -- it's perhaps the most intriguing work on the disc. "Copper Flying", John Oliver's MIDI guitar/computer duet, ends the disc with a quiet but unnerving series of jangly near-melodies -- it sounds like the interactions and occasional collisions of a huge metal model of the universe. I hope my ringing endorsement is made clear when I say that I can't wait for Harangue II! Propulsion. Spirit invocation. A sense of being catapulted into a slippery enharmonic cloud. Bathed by a timbral shower. A lyrical, intense sonic meditation on the experience of childbirth. Overly poetic descriptions?, perhaps, but these are a few of the impressions that spring forth from a recent compilation of electroacoustic work from Vancouver entitled Harangue 1 from Earsay Productions. If Harangue 1 is any indication of what is to come for the rest of the series, the state of the electroacoustic musical soundscape is vibrant and definitely embued with a sense of place, that being this wet, west coast. Composers/producers Andrew Czink and John Oliver have put forth an interesting premise for this series. The definition of a Harangue goes as follows. "Story has it that the ancient Scots, when they needed some social or political business taken care of would stage a harangue; where a villager would present an idea to a circle of peers seated on stones. When the oratory was done, those in the circle would throw back their responses." Most of the compositions on this CD seem to have this pervasive sense of luring one into the composer's harangue if you will, that the composers are committed to eliciting the emotional response in the listener, as opposed to an admiration of the technical. Rather than displaying jaw dropping pyrotechnics or technological calisthenics of the latest toy, this collection often transcends the sometimes sterile practice of electroacoustic studio technique and glows with a human beating heart. Most of these works restored some faith in this listener that electroacoustic composition is a very expressive medium that can speak to a larger listening public in a non threatening and ultimately emotional way, and that all the technology in the world is still just the means to the spirit of a piece, not the piece itself. Nowhere is this more apparent than on the albums first offering, the rather cinematic shadeless, peopled , by Andrew Czink. From the initial object whizzing by one seems to be propelled into a somber metallic landscape bereft of all foliage filled with thousands of ghost like humans trudging along and ascending through an industrial horizon. A choir of entranced female voices emerge and the composition reveals an invocation towards the human. The piece slowly winds down leaving a resonating timbral clang of various bells and alloys evoking an atmosphere of stillness and reflection. This is when electroacoustic music is compelling; being drawn into the lushness of the composers own interior visual narrative. Czink's composition invites us and sometimes grabs us by the scruff of the ears to enter his haunting timbral vision. In Susan Frykberg’s Astonishing Sense of Being Taken Over by Something Far Greater than Me, we find, as in much of her past work, a continuing fascination with the human voice in all its possible states as one of the sonic foundations of her compositions. For Frykberg the human voice is frequently the major emotional chisel that has the power to carve through the sometimes inhuman manifestations and complexities of the creative electroacoustic process. The seemingly disparate polar opposites of a woman's voice conveying the experience of her body during childbirth, and the algorithmic complexities of granular synthesis appear as two powerful sonic entities throughout the piece. The sonic thread that links the piece together is the lyrical and fiery playing of violinist Nancy Dingo. The clarity of the melodic line seems to become the mirrored expression of the woman's voice, and provides some middle ground for the listener to relish and contemplate the challenge of the composers attempt at sonically expressing something that is inexpressible, and ultimately beyond mere words or music. In the two works that follow, To Lions Gate by Damian Keller and Sere by Giorgio Magnanensi, although successful on some levels there is an occasional tendency for the pieces to lapse into "the toy is the thing" mode. It should be apparent by now that one of the pitfalls of working with the many new technological sound canvasses available to musicians and composers now, is to dryly demonstrate the capabilities of any particular mechanism. Even though many issues are continually brought up around the use of all these new technological advancements, certain core questions must, and always continue to be asked, like, where is the art? Where is the connected human intelligence behind the composition? Is there some sense of intent or rasa being evoked? I often feel that a good percentage of what electroacoustic music will always be about is pure technology on display, without identity, intention or personality, and maybe it's okay in the end anyways; why can't sounds just be appreciated as sounds existing in disembodied space, whether or not they are coming from an electronic tool? I would like to suggest that the interesting works in this field have almost always had the sense of something being crafted by a human demonstrating some sort of assembly or compositional tendency. A CD skipping may be momentarily curious to the ear but ultimately unsatisfying. Sere by Giorgio Magnanensi is an example of an apparently obvious simple looping process never becoming that compelling because it stays exactly that; an apparently obvious simple looping process. The source materials of pitch and rhythm are interesting enough but the composition fails to transform into any sense of development and one feels like one is listening to someone manipulating some gear without any depth of feeling. The Lions Gate Bridge, becomes Damian Keller's focus for a transformed and fragmented snapshot of a Vancouver architectural landmark. A minor problem with choosing such a strong sense of place and identity for most Vancouverites is that it sets up some sense of expectation as to how the composer will choose to create with such a unique soundscape. If the composition itself doesn't allude to, transform or change the aforementioned location in some recognizable sense then the question begs, why bother?, why bother anywhere? Even though this listener is from Vancouver it took quite a bit of effort to read in the sense of place that I feel towards that part of the city as well as to what the composer was intending when he chose that particular place. In contrast, Talking Rain, by Hildegard Westerkamp is clearly working with a force of nature that is our identity here in Lalaland, water. Lots of it. In all its guises. Puddle, stream, downpour, shower, drips dripping on your roof, cars and trucks driving through it, you name it, water and our proximity to it, is in our bones in Vancouver and maybe this kindled a particular type of affection for this piece. She seamlessly weaves water in all its identities into a sensual collage that resonates within, and for a brief time puts a part of oneself in touch with a state that is very, very old, primal, quite possibly out of time, dare I say timeless?, I dare. Like looking at many photographs of the same shot with each shot having a different depth of field, Westerkamp deftly crafts together water in all its manifestations into these intimate sonic polaroids that flow in and out of each other. Its amazing the amount of sonic information contained in a wee drip of water that is recorded very close, as if the water was whispering in your ear. Imagine the approach of a tractor trailer barreling down a rainsoaked highway, mixed with someone gently lapping their hand in a small pool; this is just one example of the type of unique sound collage found in Talking Rain. There are two points which the composer deserves high praise, one is the incredible fidelity of the field recordings and the care taken with noise reduction, a difficult task with recordings of this nature, and the degree to which Westerkamp stays out of the way in terms of the manipulation of the sounds. If there was any processing or treatments to the tape they were imperceptible and all but invisible. I had one of those sublime moments where upon deeper examination I realized that the composer may have done a little processing on some very tiny fast dripping droplets of water, and then I realized that I have encountered a sound like that in my life, a processed computer like sound, sitting beside a small creek in the spring when its beginning to thaw and small drops of water are dripping under the ice downwards and its almost metallic, and then I realized it doesn't matter either way. My recollection of that sound, her processing of that sound, her recording of the real sound... many are the ways of perception, memory and manipulation! Hildegard Westerkamp's work at its best brings us closer to the notion that we are the sounds that we hear...the "just listening" state...the dissolution of the "me listening to that " construct, this is the essence of Talking Rain. In John Oliver's "Copper Flying" , an aptly titled harmonic flight into the potentialities of new guitar technology, we glimpse the use a wind controller, the strumming and plucking of a guitar as the medium of extraction of timbral goo and a computer listening, mediating and making choices based on various inputs. Oliver caresses bizarre sound clusters out his instrument as the dialogue between computer and human playing instrument reveals a type of music making that comes across as gestural, felt. The occasional appearance of excited string, distorted or processed, brings us back to the image of a real person conveying a physical harmonic gesture to the computer and then the somewhat surprising results seem to ooze outwards in an unexpected way, you are never quite sure of what will come and this is the strength of the piece. The explorations of this new MIDI guitar/wind controller/computer configuration that are being mined now by composer John Oliver and the spectrum of sounds created by this type of interactive performance, makes intimations towards another new possible language and vocabulary for the good old guitar. Much of the first half of Andrew Czink's shadeless, peopled lives up to the cacophonous connotations of this album's title. Some metallic crashing noises ...harass your ears, then spawn an insistent rhythmic pounding... About halfway through female voices emerge from this "...shadeless road peopled with ghosts," and offer a hymn to the sun. The voices are shadowed by their own echoes... The ending features a whirlpool of rising tones that ring bells and invite angry, swirling winds, as if a space ship is ascending to the heavens. Susan Frykberg's Astonishing Sense ... offers substantial merit, not least because of the excellent writing for the violin. Nancy DiNovo's playing captures the atmosphere quite effectively, and comfortably meets the technical demands. To Lions Gate, by Damian Keller, offers sounds from Lions Gate Bridge (North Vancouver). The notes do not specify what sounds were recorded and processed, but much of the sonic fabric clearly betrays its metallic origins. The piece seems to evolve from sustained notes and chords that crescendo and decrescendo, pulsate and break apart. ...Giorgio Magnanensi's Sere, ... appears to present a song from the composer's native Italy, ...processed as if in an echo chamber and accompanied by clicks that seem almost identical to the sound a CD player makes when playing a badly manufactured disc. Not much beyond this seems to happen, though the ending, with many of the competing lines stripped away or scaled down, does offer a certain charm in its humorous rhythmic voices and other sonic shenanigans. Ms. Westerkamp's [Talking Rain] is animated and evocative, peaceful and ominous, cold and warm. It is harmonized in places by other sounds from nature, like birds, but intruded upon by those from the city, like cars, the human voice, and footsteps. Processing is relatively modest in much of the piece, the composer allowing nature to tell its story. When the processing becomes dominant, it is quite often in the mimicking or exaggeration of the sound of rain itself. Try the passage beginning around 7:34, where the droplets become rapid and high-pitched, scurrying about to a background of slower droplets seeming to strike hollow wood or metal. A downpour ensues amid busy sounds from trucks and cars, all to wonderful effect. This 17-minute-plus piece is by far the longest and, more importantly, most rewarding work here. In addition, the composer's notes about the rain sounds (from the west coast of British Columbia) and about the work in general are most informative. John Oliver's Copper Flying closes the disc on a very positive note. The sounds are from a MIDI guitar that, after a restless opening, seem to become blasts from space-age brass instruments: they repeatedly howl and bellow stately, powerfully ominous sustained chords that diminish in rapid descending scales. This is most engaging, creating an image of the guitar coming to life via some sorcerer's apprentice and doing mischief. At the end the guitar returns to a completely peaceful demeanor. A most effective and evocative piece. In sum, the pieces by Oliver and Westerkamp are successes here, and the entry by Frykberg, while less compelling (though thought-provoking), is also worth examination. The sound is excellent throughout.